OH HELL YES! I feel like I should elaborate more on this, but if you read the book and loved it, there really is no need. 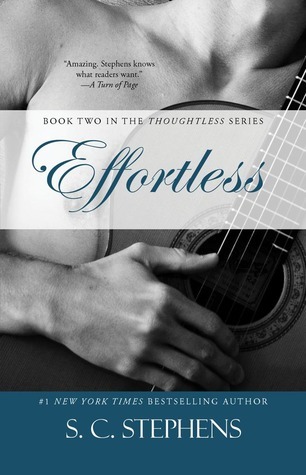 If you haven’t read the book, you need to start with Thoughtless, and then read this one – Effortless. You’ll understand why everyone wants to work in a bar. Why mornings are the best part of the day, and why sleeping on a futon is the best thing since sliced bread when it’s with a rock star. The character development in this book really took all of the main players to the next level. I even found myself loving Griffin (not in the same way as Kellan, but a close second)! If you read this book or know of the series, then you might know that the 3rd and final book is coming out March 5, 2013. DO NOT READ the excerpt for Reckless! Unless it’s at 11:55pm on March 4th and you know that it will be on your e-Reader at 12 on the dot. There are not enough swear words in the English (or Estonian for that matter) dictionary to explain how angry I am that I let myself read it, knowing that I have to wait. Luckily, I was sitting at home (and my son was already asleep), when I let out this long string of expletives that would make even truckers blush.